One of Megan's favorite ways to pass these cold Autumn days is to curl up with a book for an hour or two and just lose herself in another world. Sometimes quite literally, but that's a story for another day. Megan Niamh Bryar belongs to me. It's funny, I have two different types of books I read. Technical manuals, and "teeth hair and eyeball" mysteries. Hm. I don't really read mysteries, except I guess for some of the Discworld novels, so I'm not familiar with that particular theme. But it sounds kind of gruesome. I read a pretty wide variety of things, ranging from fantasy and science-fiction, preferably the old-school canals-on-Mars stuff, to some horror and what is often referred to as literary fiction. I have a particular interest in Southern Gothic literature, with a special fondness for Flannery O'Connor and Lewis Nordan. I enjoy reading history texts sometimes, too, and I was recently surprised to find that one of my favorite historians also writes mystery novels. Fairly mediocre ones, from what I'm told, but a lot of academic types seem to have trouble branching out into fiction. It probably works the other way around, too, which is probably why I've never managed to write the history text I used to say I was going to do. Well, it was a short list. Recent technical manuals, C++ for an embedded processor, and on the other end, the service manual for a 1932 National Radio FB-7X receiver. I'm a huge fan of this particular theme, and the artist did it really well. 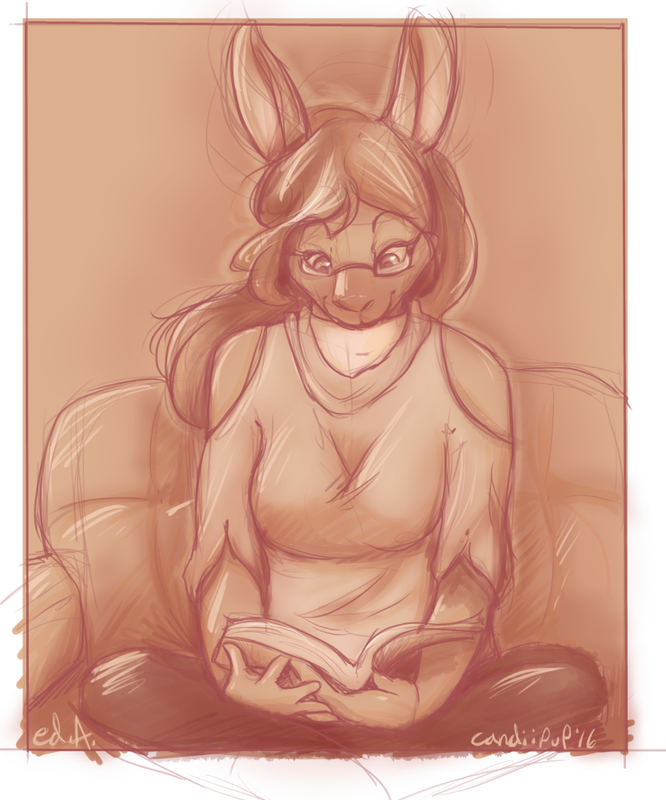 She looks so blissfully engrossed in her story, and those clothes look really comfortable! It's one of my all-time favorites, too, and one I don't indulge in nearly enough. The artist really did a fantastic job with everything, I most certainly agree, and I love her shirt. I want one just like it!